In a ruling issued on Friday, the court said the electoral board committed "irregularities and illegalities" during last month's vote, harming the integrity of the election. 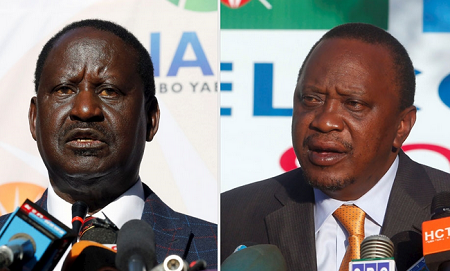 The court ordered another presidential election to be held within 60 days. "The declaration [of Kenyatta's win] is invalid, null and void," said Judge David Maraga, announcing the verdict of four out of the six judges. No presidential election in Kenya has ever before been nullified. Maraga said the election commission "failed, neglected or refused to conduct the presidential election in a manner consistent with the dictates of the constitution". A lawyer for Kenyatta, Ahmednasir Abdullahi, said the decision was "very political" and the election board had "done nothing wrong". But he said the decision had to be respected. The protest was brought before the Supreme Court by opposition leader Raila Odinga. Kenyatta was announced the winner with 54 percent of the vote - but Odinga claimed the election was rigged with electronic voting results hacked into and manipulated in favour of Kenyatta. Kenya's electoral commission had said there was a hacking attempt but it had failed. International election observers said they saw no interference with the vote. Odinga supporters erupted in jubilation after the decision was announced. "This is an unprecedented ruling," Odinga said outside the court. "This is a triumph for the people of Kenya."